A BCAA Powder with EAAs and some carbs to get you through your workout! Amino Recovery Complex! Increased Muscular Protein Uptake & Rapid Glycogen Replenishment! Outbreak Antidote is the ultimate recovery formula for post-apocalyptic survivors that are pushing their bodies to the limits. The Antidote formula was designed to encourage advanced recovery through increased muscular protein uptake and rapid glycogen replenishment. A full dosage of branched-chain amino acids and essential amino acids are utilized for rapid replenishment of protein into muscles. As if that wasn't enough, easily digested and fast acting carbohydrates combine with the full clinical dosage of ActiGin for clinically proven facilitation of advanced glycogen replenishment. This cutting edge product has also been shown to lower inflammation, increase V02 max, and decrease muscle damage after training. 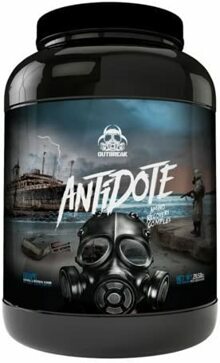 When your body aches from a brutal session, Antidote provides the cure. This is not just a sports supplement; this is a supplement for survival.